For typical measures there are analyzers like the Number analyzer and String analyzer. These analyzers calculate standardized measures for these data types. There's the Value distribution analyzer which is interesting because it uses a backing database (using the @Provided annotation) for counting unique values if the values succeeds the amount of free memory. The Date gap analyzer is also a good example because it has named input columns, used for building a timeline of from- and to-dates. The Pattern finder analyzer which you can read a lot more about in one of my previous blog posts. So let's begin with a simple example. 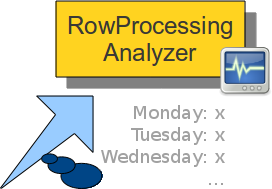 Say you want to build a very simple analyzer that consumes date or time based values and determines the value distribution based on day-of-week (ie. how is the distribution of values grouped on monday, tuesday, wednesday etc.). While this is a rather naive example of an analyzer, it will work well as just that - an example. You need to define a class that implements the Analyzer<R> interface. The generic 'R' argument defines the result type of the analyzer. We can reuse a built-in result-type or write our own. The class needs to be annotated with the @AnalyzerBean annotation. This annotation takes an argument: The display name of the analyzer. You need to inject one or more InputColumn<E>'s using the @Configured annotation in order to consume the incoming data. The <E> type-parameter defines the datatype of interest, which is also used to determine which kinds of data types the analyzer supports. In our case we'll use Date as the InputColumn type, because we want our analyzer to consume date values. Notice that we're using the built-in result type CrosstabResult, which represents a result consisting of a dimensional crosstab. We could have used other built-in result types or we could have created our own result-class - the only requirement is that it implements the AnalyzerResult interface. The rest of the Analyzer should be "plain old Java" but of course using the API's that are available in AnalyzerBeans. I've explained most of these things before, but I'll go through it again. To initialize the map we need to have the InputColumn's injected first, so the constructor won't do. In stead we can annotate a method with the @Initialize annotation, which will make AnalyzerBeans invoke the method when the bean has been properly initialized. You can also check out the unit test for this analyzer here. I've previously posted a blog entry about how you could now download and run a simple example of AnalyzerBeans in the shell. I've updated the example and improved the command-line interface so that it will further assist you if you are interested in using the tool. I'll help you read this output: There are three analyzers listed. The String analyzer and Number analyzer both consume multiple columns, which means that they can be configured to have multiple inputs. Value distribution is another analyzer which only consumes a single column and has three configurable properties: Record unique values, Bottom n most frequent values and Top n most frequent values. So now you have all the details that enable you to author an XML-based AnalyzerBeans job yourself. Let's take a look at the example. I'm going to post a few snippets from the employees_job.xml file which I also used in my previous post. Notice that this file has been updated since my last post so you will need to run an "svn update" if you followed my previous tutorial, in order to get up-to-date code and data. The content is almost self-explanatory. There's a reference to the employees_csv datastore and the three columns defined in the CSV file: name, email, birthdate. Notice the id's (marked in red) of these three columns. These id's will be referenced further down in the XML file. I hope that you find this XML format pretty straight forward to author. Of course we will be implementing a graphical user interface as well, but for the moment I am actually quite satisfied with this early user interface. In this blog-entry I will demonstrate the Java API of DataCleaner to create transformers, ie. components for transforming/converting/tokenizing/generating new values based on the existing values of a dataset. You will need Java programming skills to follow this tutorial. After the transformation I will be able to independently process the age field, eg. with a number analysis, value distribution or apply some business rule that depends on age. The class must implement the Transformer interface. Of course I didn't do all the work of writing this tutorial without checking in the code so you could try it in action. The code for the ”Date to age” transformer is available here and there's also a unittest available here, that is pretty usable as a demonstration of how to unittest transformers. I hope some of you engage in developing transformers and let me know how it turns out. In my next blog post I'll explain how to build Analyzers which are the obvious next step when developing components for DataCleaner. The Convert to date transformer which will try to convert any value to a date. This is perhaps useful in combination with the transformer that I've just explained in this tutorial. 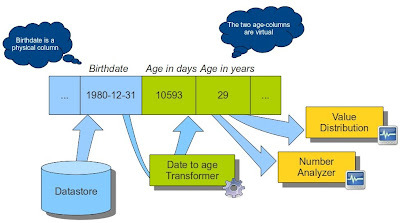 In other words: These two transformers may need to be chained if for example the birth date to be transformed is stored in a String-based field. The Tokenizer transformer because it has a flexible amount of output columns based on the users configuration. Notice the @Configured Integer numTokens that is used in the getOutputColumns() for this purpose.